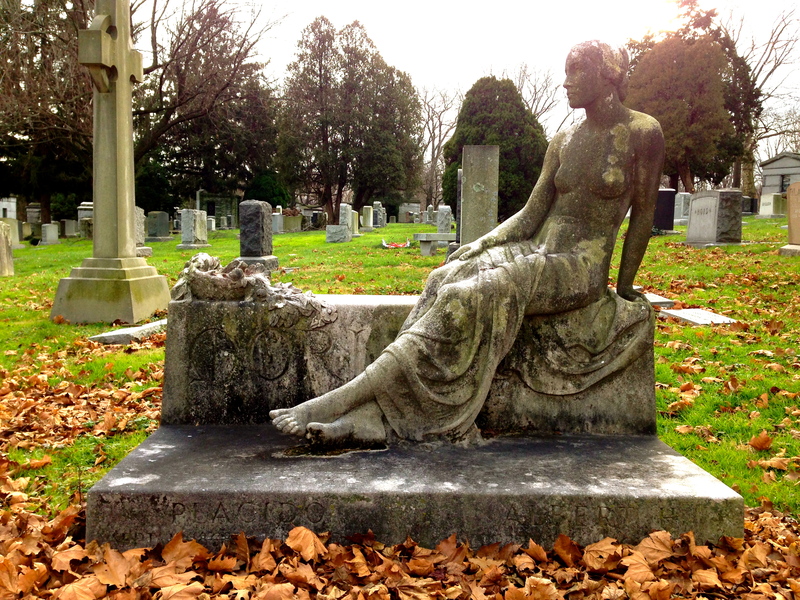 Pastoral, gentle Woodlawn Cemetery in the Bronx doesn’t have the recognition of Green-Wood Cemetery or The Evergreens, both in Brooklyn. But it’s a similar kind of final resting place: an 1863 “rural” cemetery created after burials were banned in Manhattan for health reasons, and designed almost as parks, for leisure as well as mourning—composed of rolling hills with the remains of 300,000 New Yorkers underneath. 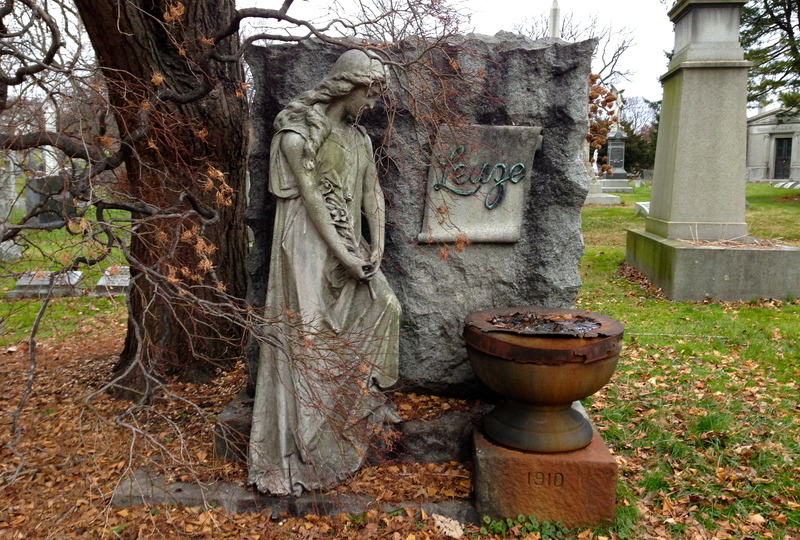 Like Green-Wood and The Evergreens, it’s open to visitors, who are allowed to navigate the landscape and gaze at the angels and other figures that decorate many of the mausoleums and graves. Captain G.H. Winter was a firefighter, the hat tells us. Could he be the same G.H. Winter awarded a medal for bravery in 1944? 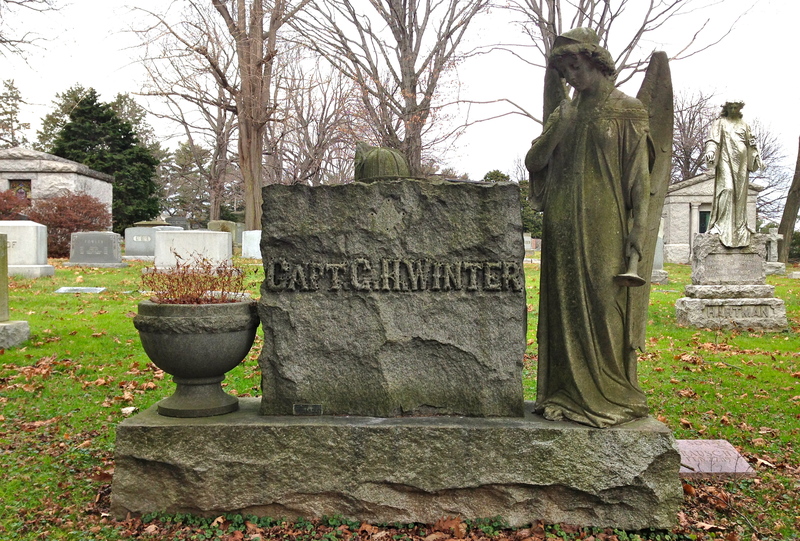 This grave looks older than that. 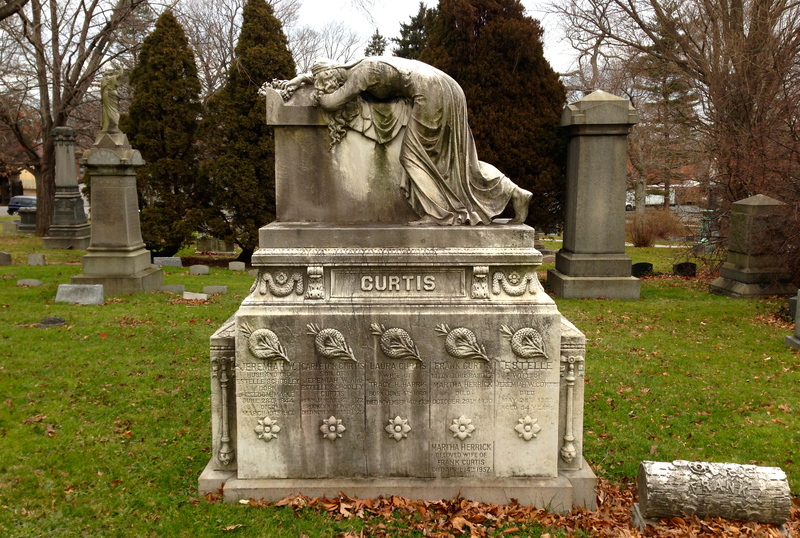 This Botticelli-tressed figure at the Curtis family tomb isn’t merely in mourning—she’s despondent and heartbroken. 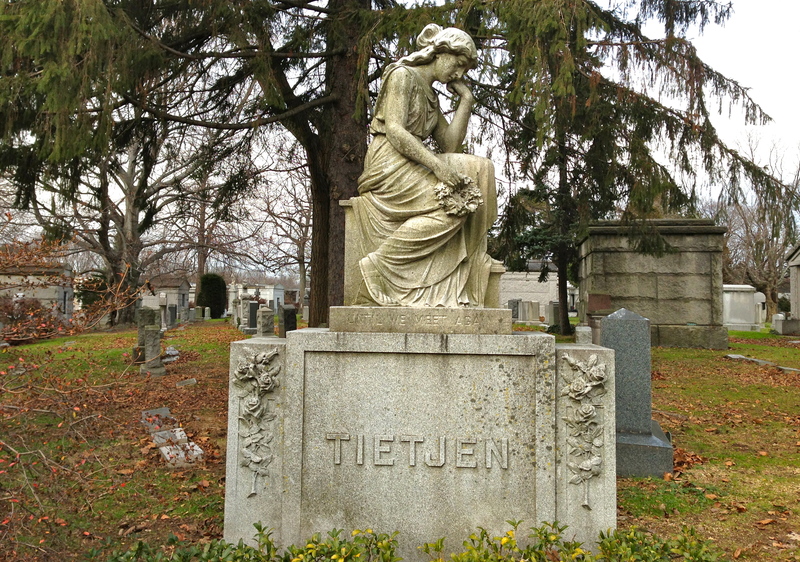 Many of New York’s leaders and hometown celebs are buried at Woodlawn: actors, politicians, sports stars, musicians. A complete list is here. Follow Ephemeral New York via Email! Enter your email address to follow Ephemeral New York and receive notifications of new posts by email. Ephemeral New York's new book made it on their 2016 holiday gift idea list. The Village Voice gave Ephemeral New York's new book a nice thumbs up. New York City in 3D in the Gilded Age was referenced in a terrific Feb. 27 Travel section article about the city's Gilded Age past. Ephemeral New York in the New York Times! Ephemeral New York was featured in a wonderful NY Post story on July 20 on the Gilded Age city. Ephemeral New York in Mental Floss! Mental Floss magazine named ENY's new book "New York City in 3D in the Gilded Age" one of their 5 favorite reads for August 2014! New York City in 3D in the Gilded Age made Entertainment Weekly's Must Have list for the week of June 27! Thanks to everyone for their support. Ephemeral New York was interviewed in a July 25 piece in The Greenwich Village Society for Historic Preservation's blog, Off the Grid. Ephemeral New York in the NEW YORK DAILY NEWS! Ephemeral New York in the Sunday NEW YORK POST! Ephemeral New York in TIME OUT NEW YORK!